Time to wake up, take a shower, get dressed, eat breakfast, watch TV or listen to music to clear your head before your day begins. You think to yourself, this is going to be a good day because I am blessed to have been able to open my eyes once more. You may think about the things you need to do for the day, think about family and friends, but no one ever thinks...Today I am going to be in an accident; today maybe my last; today my faith will be tested. I know on December 15, 2013 I didn't. It was a regular day, waking up getting ready for work, listening to music and joking with my kids. I'm leaving the house and because it had snowed the night before, and I like many others are fearful but capable of driving in the snow, I decided to take a different route hoping to stay on flat land. I approached Bigelow Blvd, passing Herron Ave, got a few feet further and began to slide and slide and slide some more. I turned side ways and eventually regained control of the wheel, got over to the side of the road and put on my hazard lights. As I looked into my rear view mirror I noticed an SUV begin to slide, as I did, but getting closer and closer and before I had time to react, the unthinkable happened and I found myself a victim of an accident that became a several car pile up. It was like something out of a movie. Everything seemed to be in slow motion, ears ringing, panicking because my driver door wouldn't open, to finally get help out of my vehicle by a police officer and my mind is racing because my van has been totaled. Fast forward a bit two days later after picking up my rental car. I'm heading home and there's no snow or anything on the ground but I feel extra cautious today. A car stops abruptly in front of me so I put on my breaks, but here I find myself looking into my rear view mirror once more and an SUV is getting to close to my rear that I panic in my head and have flash backs to that day. I took a deep breathe and continue driving, even more cautiously than before; hands at 10&2, shoulders hunched up, back stiff, praying the rest of the way home. Once I arrive I turn off the car to thank the man above, step out of the car and enter my home, sit on the couch, get into my feelings and began to cry. I tried to hold it in as long as I could. What is happening to me, I am a man and I can handle this. I will not let this get the better of me I began to think. I am one that tries to hold in my feelings and work through my problems on my own and sometimes it begins to become to much for one to handle. So I confide with one of my best friends that years ago I had a dream where I died in a car crash driving on wet pavement on the parkway. 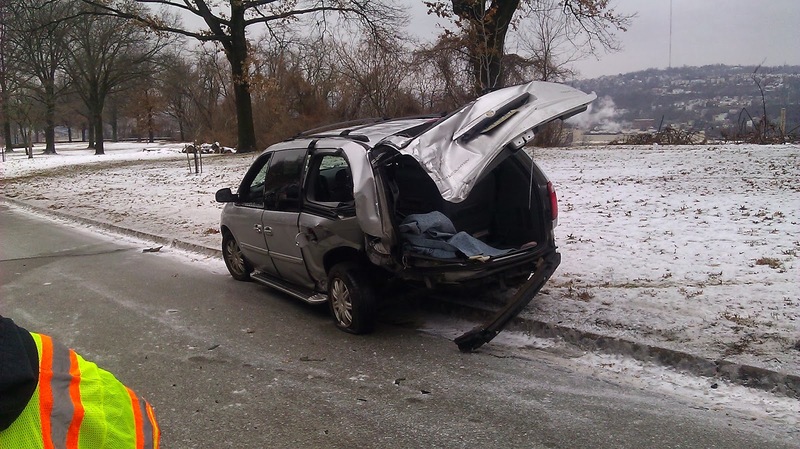 I then begin to think bout the day of my accident and the look of my van and thanking the Lord that my kids weren't with me on that day. Now two weeks have past I'm in the car with a new friend that is driving and its snowing again. We both began to discuss our concerns with the snow and how we both had car accidents and how they have affected us. We are easing down the road which has a slight slant to it. I can't help but brace myself and clinch to the chair and check to make sure my seat belt is safely secure still. Thank goodness for the salt truck that day as we followed him all the way to our destination. I ask you, am I the only one..What is to become of me...Why must I endure this agony...What is the meaning of these episodes of fear each time I ride in a car and see signs of snow or ice. Some call it Post-Traumatic Stress Disorder. What is this you ask? "Post-traumatic stress disorder (PTSD) can develop following a traumatic event that threatens your safety or makes you feel helpless.